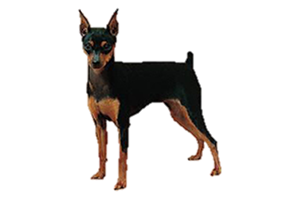 Today the Miniature Pinscher is kept as a companion and show dog. Originally they were bred as ratters, often living in barns with little human contact, much like a feral cat. Their German name of Zwerpinscher translates to 'Dwarf Terrier'. While artwork depicting dogs very like the Miniature Pinscher date their origin around the 1700s, written record for the breed did not exist until the 1830s. It is thought the breed was developed by miniaturizing the older German Pinscher. Although it shares its coloring with the Doberman Pinscher, the two are only related by their individual links to the German Pinscher. The Miniature Pinscher actually predates the Doberman by roughly 200 years. Is the Miniature Pinscher Right for You?